LINCOLN – After getting bumped on a hard drive to the basket to begin the second half, Nate Mason fell to the floor with a surprised look on his face. Mason and his teammates made it a habit in Tuesday’s 78-68 loss at Nebraska to show their frustration at that some missed fouls against the Cornhuskers, who were able to play much more physical than Richard Pitino's team was used to so far this season. That disrupted Minnesota’s offense to shoot a season-low 32.4 percent from the field (22-for-68). The only time the Gophers shot worst in the last two seasons were in losses at Florida State and Wisconsin in 2016-17. Mason isn’t the first person to criticize the officials in this first ever early December start to Big Ten play. Northwestern coach Chris Collins went on a postgame banter about the free throws being one-sided in his team’s 74-69 loss Sunday at Purdue. The Boilermakers outshot his team 24-5 from the foul line. The difference in free throws Tuesday was only 28-24 in favor of Nebraska. Fouls were close 23-19 with Minnesota slightly ahead. 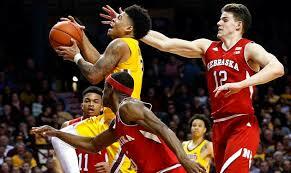 The Gophers were more concerned about struggles guarding pick-and-rolls. Sophomore Amir Coffey, who had 17 points Tuesday, agreed that Gophers’ opponents moving forward will look to exploit their lack of cohesiveness defensively if they don’t show improvement. Part of the reason for the Gophers’ poor shooting Tuesday was the lack of production in the paint. Minnesota’s usually dominant frontcourt of Jordan Murphy and Reggie Lynch combined for just 19 points. Murphy, who averaged 21 points entering the game, had just 10 points on 4-for-12 from the field. Without much help inside, Minnesota’s guards were forced to take contested shots and also had poor shot selection at times. That resulted in Mason, Amir Coffey, Dupree McBrayer and Isaiah Washington combining to shoot 33 percent (15-for-45 from the field) against Nebraska. Much like the loss to Miami (Fla.) last week, the Gophers weren’t sharing the ball finishing with just nine assists and 13 turnovers Tuesday. Another common factor in both losses to Miami and Nebraska was the lack of bench support. The Gophers had zero points off the bench against the Hurricanes, but Washington was forced to start with Dupree McBrayer out with a leg infection. McBrayer was back Tuesday against Nebraska for the second straight game. That meant Pitino had Washington to give Minnesota more punch off the bench, but it just wasn’t there. Washington had just five points on 2-for-7 shooting in 17 minutes. The Gophers basically used a six-man rotation most of the night with no other reserve playing double-digit minutes. Backup posts Davonte Fitzgerald and Bakary Konate struggled with no points on 0-for-5 shooting, five fouls and two rebounds in 14 combined minutes against the Cornhuskers. Can Pitino's Gophers have a defense that matches their skills on offense? Are the Gophers ready for Arkansas' 40 Minutes of Hell style?